Ensure that the Fibaro HCL is on. Press the two buttons on the back of the HCL at the same time. When the LEDs turn on from both edges to the center and vice versa, release the buttons. Enter the IP address that was used to log in to Fibaro HCL into your browser. Note: If you hold the Recovery button for 10 seconds the Home Center IP will be set to 192.168.81.1 and you’ll need to adjust the network settings on your computer in order to access the unit. Available options will vary depending on your controller model and firmware version. This can be considered a “soft reset” – it will download the latest Home Center Lite firmware and install it on your device while keeping all user data. If you lost access to your unit Web UI and don’t want to start from scratch, this should be your preferred choice. Same as above but will ask for a local file instead of downloading the latest available firmware. It will download the latest Home Center Lite firmware, install it on your device and remove all user data. Use It as a last resort or if you do want a fresh start. Enter the IP address that was used to log in to Fibaro HC2 into your browser. 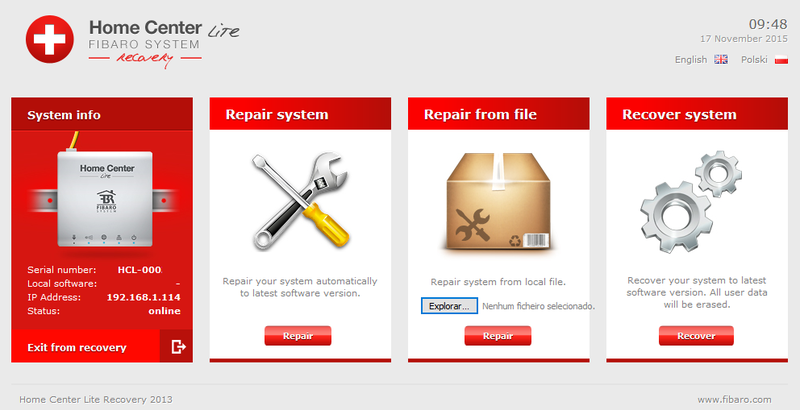 This option will perform a full reset and restore to factory default, removing all user data. The firmware will be restored to whatever version the Home Center 2 shipped with - you can see the version mentioned in "Recovery Version" field on screen. It’s possible to reset just the Z-Wave device memory in the Home Center controller. It will remove all data on the Z-Wave chip, which also deletes all Z-Wave devices paired to Fibaro but keeps your scenes, network settings, users, virtual devices, etc. You will then need to Exclude any devices you previously Included, and then Include them again. Note: Should you change your mind, you can restore the Z-Wave network from a backup as long as you haven't Excluded any of your devices. 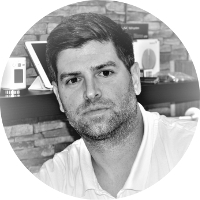 Once you have Excluded your devices, the process is irreversible, they will not come back, even if you restore the Z-Wave network from a backup. 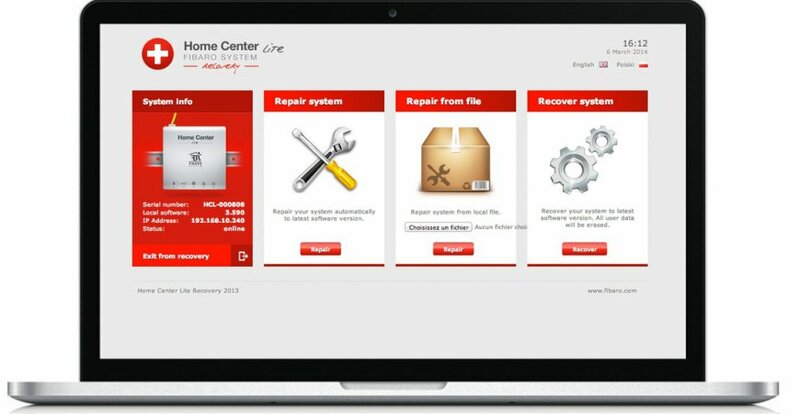 To create and restore Home Center backups click on the "Configuration" tab and then "Backup & Recovery". A list is presented with the available backups, date and firmware version that they were created with. If the backup is compatible with your current firmware version you are given the choice to restore it. Note: We recommend to regularly create a backup, especially before doing any major changes on your unit. podpora fibaro po mě chce abych udělal revovery, protože se nemůže připojit k HC2 pro to aby odstranila nefunkční zařízení, které nejsem schopen odstranit já z webového rozhraní. Když provedu recovery do továrního nastavení, zůstanou v HC2 moje zálohy abych mohl obnovit moje nastavení? áno zálohy Vám ostanú v systéme avšak pravdepodobne po obnove sa Vám zobrazia aj zariadenia, ktoré Vám nejdú odstrániť. Ak ste mali nastavené nejaké vlastné ikony, tie budú vymazané a budete ich musieť ručne vložiť. Čo sa týka problému ručného odstránenia zariadení, v niektorej z verzií Fibaro Systému s tým bol problém pri nastavenom CZ jazyku. Skúste zmeniť nastavenie jazyku na EN vo Fibaro webovom rozhraní a tak odstrániť nefunkčné zariadenia.